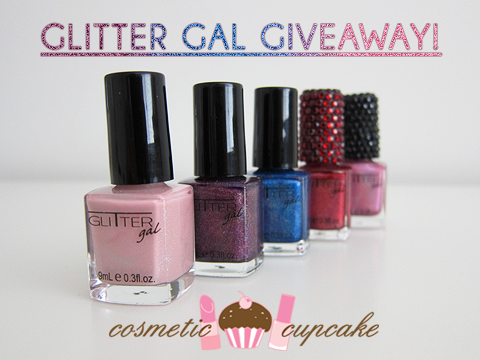 Cosmetic Cupcake: Glitter Gal giveaway!! I am so excited today to bring you my next giveaway which has been kindly brought to you by Glitter Gal. The lovely ladies behind this great Aussie brand - Kerry and Anna - have kindly offered TWO polishes to one of my lucky readers! The best part is, YOU get to choose the colours you would like from their awesome 3D Holographic or 3D Sparkle range! Please note: The nail polishes pictured above are from my own collection and are for illustration purposes only. The winner will be receiving TWO nail polishes of their choice. If you're stuck on which colours to choose, check out my review and swatches of Marine Blue, Purple, Not Another Red and Ballerina which are all from their 3D Holographic collection. Please fill out the form below with all your entries once to enter! Please do not submit your details in the comments of this post - I will NOT count these. The winner agrees to provide their shipping details to Glitter Gal so they can send you your polishes! Giveaway is open internationally and will close on May 1st at midnight Australian Eastern Standard Time. Good luck! A big thank you to Kerry and Anna for the prize! Cool giveaway. I've entered and added it to this month's giveaway roundup. Good luck to everyone and thanks for hosting yet another giveaway, 'Chelle. I accidentlly press Enter and submit my form before i finish fill the choice of the polish.. izit ok? Glitter Gal have the cutest polishes! Yay I had to enter. I accidentally hit the return button before I completed the form, so i had to enter twice. Please disregard the first entry. Sorry about that! I am filling out the above form and suddenly have a peculiar feeling I've already filled it out. Just wanted to leave a note to say that if this is the case I really didn't mean to enter twice, but totally disqualify me if I did!